Have suggestions for products that you’d like to see reviewed by our expert? Email him at craig@inman.com. Customer relationship management, or CRM, has become a somewhat ubiquitous term slapped on any enterprise software system that more or less enhances the way we manage contacts. Thus, a well-designed Excel sheet could be a CRM. That said, it isn’t right to call Propertybase a CRM. It’s so much more. If you use it only to remember when a client has a birthday, well, then, you’re doing it wrong. However, when it comes to whole-office platforms, I wonder: Is there such a thing as too robust? The Salesforce-powered Propertybase is too meaty and calorie-rich for a small, independent real estate office. This is John Candy’s “Old 96er” from “The Great Outdoors.” Its carb count is probably due to its applicability to both developers and commercial agents. This means it has the intrinsic power to manage multiple teams of tin knockers and tenant reps in overpriced suits. I find this system best for larger, multi-office residential operations. But that doesn’t mean its expensive. At $69 per user-month for the “company edition,” it’s not that spendy. There is a four-user minimum, however, so you’re out the door at a minimum of $276 per month. The “enterprise version” of Propertybase for Residential, which adds MLS (multiple listing service) connectivity, financial reporting and franchise management tools, asks you for $89 per user-month with a 10-account minimum. That’s a bit steeper. But again, it’s for teams and multiple offices, so costs can be spread. The feature set in Propertybase is hearty, with task assignments, showings management, listing inventory integration, buyer profiles, embedded HTML email tools, intricate search functionality and granular reporting. I’m very much a fan of how simple Propertybase programmers have made it to silo an entire transaction, from the buyer’s initial click of interest via its lead capture feature from your website, all the way down to uploading files sent from the closing team. Users can search for a buyer’s preferences among your company’s inventory and quickly return a visually appealing, comprehensive report from directly within the dashboard. With the nationwide MLS connectivity, your search reach becomes vast. It has tools for brokers and office managers, too, like commission tracking, desk-fee parsing and forecasting capability. Thus, an entire transaction can be managed via Propertybase, not just the name and number of the woman you spoke to at Panera Bread. Propertybase for Residential is what I call “full-time” software. To saddle this stallion of productivity, you’re going to need someone to focus on lassoing it, as well as staying on top of agents with access. It needs to be open in your browser throughout the workday. This doesn’t mean it’s hard to use: Everything is right up front, visually ergonomic and very much relational, meaning a note you add about a listing client’s phone call will appear in each instance of that contact’s record. You can jump around cleanly amongst the records and transaction milestones and quickly find what it is you need. So again, capability isn’t the issue here; commitment to it is. Lastly, if you’re going in on Propertybase, go all in on its partnership with Cirrus Insight. This Gmail bolt-on is light and skillful, embedding itself on the sidebar of your inbox to stream contact, task, activities and transaction data as you work in your browser. Having all that data right next to your Gmail account creates a sense of action around your workflow; it’s ever-present and unobtrusive. This is a sharp feature that even has system admin functionality. 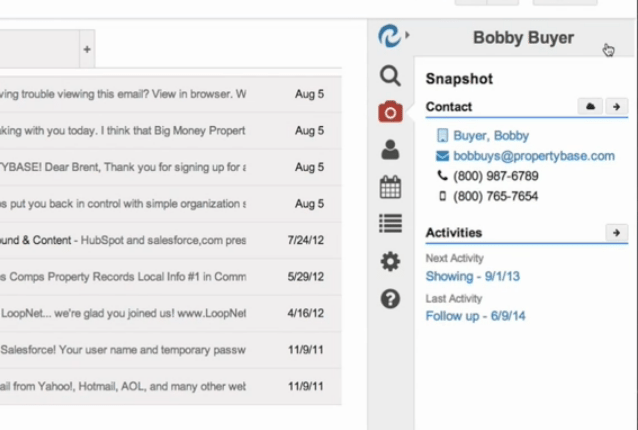 Screenshot of Propertybase integrated into Gmail using Cirrus Insight. There are an array of additional tools you can add on to Propertybase. You can connect to Box.com, Dropbox and DocuSign. 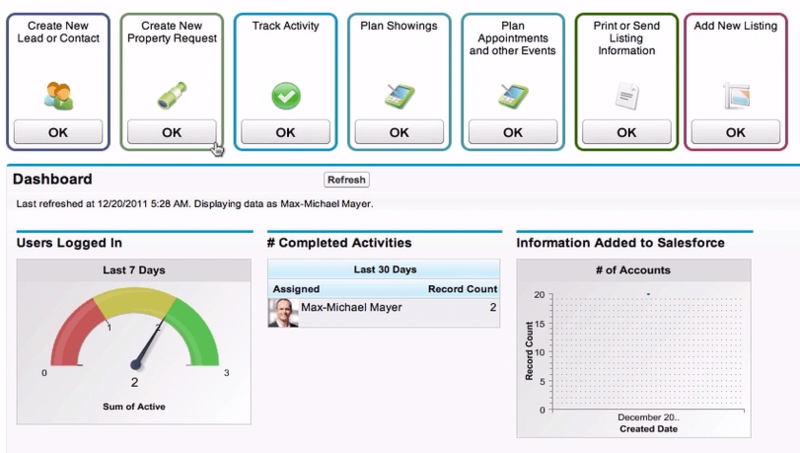 You can also make Skype calls and link records to QuickBooks. 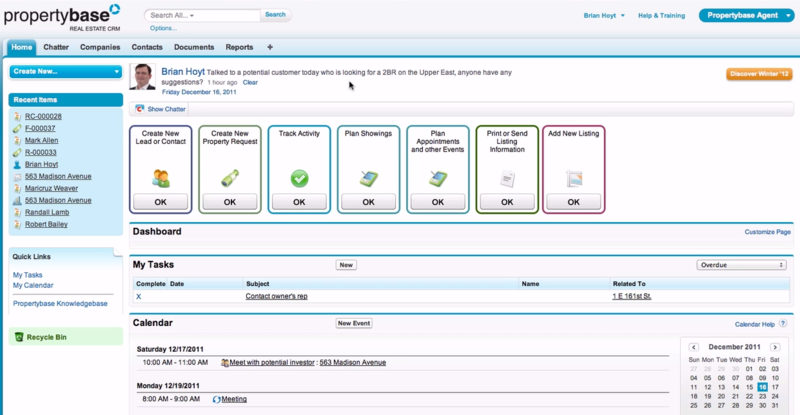 Propertybase for Residential is much more real estate office management system than it is a CRM. Robust and deeply programmed, all levels of user will need complete buy-in for your operation to get the most out of it. If that’s the case, you’ll get all of that “most,” and probably more. Have you used this product? What did you think? Leave a comment and let us know!